2011Glacial recession is clearly visible in the three pictures of the southern icefields that were taken from near the Barranco Hut, the first in 1984, the second in 1998 and the last in 2011. The most evident changes have occurred on the Heim Glacier. 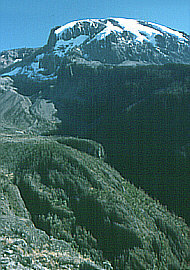 In 1984 this is seen to have a "dog leg" in it; it reached down lower than any of the other glaciers in this, the central part of main southern icefields. 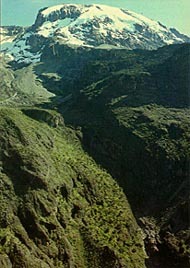 In 1998 it is seen its upper reaches to have a much bigger gap separating it from its neighbouring glacier to the right. The bottom section, below the original dogleg, is totally missing and represents a loss of ice extending about 300m vertically. Changes from 1998 to 2011 are less evident but recession clearly continues. The remnants of the ice cap can be seen as the spectacular ice cliffs of the Northern and Eastern Icefields, and the longest glaciers are found on the precipitous southern and south-western flanks. If the present rate of glacial recession continues the majority of the glaciers on Kilimanjaro could vanish altogether in the next 50 years. 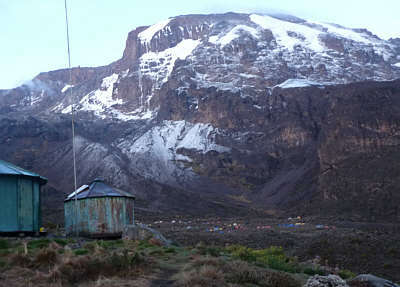 A recent study carried out on the snows of Xixibangma and Kilimanjaro has reinforced observations. It is now estimated that Kilimanjaro has lost 75% of its ice cover (by mass) since 1912. See also Glacial recession in the Rwenzori. © Andrew Wielochowski 10/06/98. From the "Kilimanjaro Map and Guide"